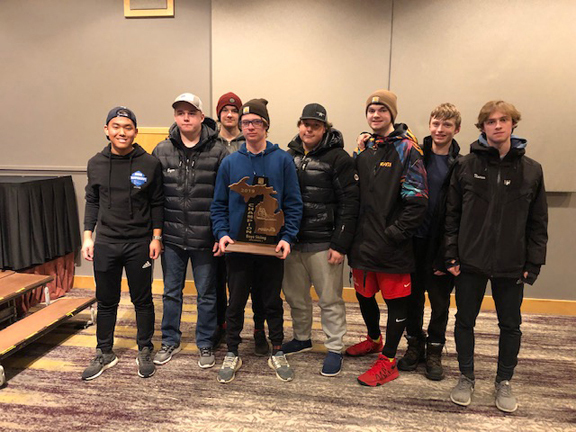 THOMPSONVILLE — Marquette nearly pulled off a sweep of the MHSAA Division 1 regional downhill skiing regionals held Monday at Crystal Mountain in Thompsonville, about 20 miles southwest of Traverse City. The Redmen boys scored 61 points to win their meet by 20 points over Traverse City West, which had 81. Traverse City Central was third with 115 1/2 while Grand Haven was fourth with 132. The Marquette boys were a close second to TC West in the giant slalom but scored a decisive victory in slalom to carry the meet. The Redette girls came up just shy of their regional title, scoring 67 points to come up just three points shy of TC Central’s winning total of 64. TC West was third with 98 while Rockford was fourth with 152 1/2. The MSHS girls won the slalom and came in second in GS. The top three schools along with a number of individuals from each of the three Division 1 regionals qualify for the state finals to also be held in the general Traverse City area on Monday, Feb. 25, at Schuss Mountain. That resort is located in Bellaire, about 25 northeast of Traverse City. One regional was scheduled for today at Pine Knob in Clarkston and the other for Thursday at Mount Brighton in Brighton. The Marquette boys are the five-time defending state champions, while the Redette girls are two-time defending state titlists. Sophomore Hayden Kauppila won the giant slalom and finished second to junior teammate Aaron Grzelak in the slalom to lead Marquette. Kauppila had runs of 22.86 and 22.00 seconds in his two GS runs for a winning time of 44.86, just eight-hundredths of a second ahead of runner-up Nick Rupert of Rockford. Grzelak was dominant in winning the slalom, clocking the fastest times in each run of 27.98 and 28.21 seconds for a winning time of 56.19 seconds, just over a second ahead of Kauppila, who clocked 28.45 and 28.82 for a 57.27 total. Also scoring for the Redmen in the slalom were sophomore Logan Audette, who was eighth in 1:01.64 with runs of 30.77 and 30.87; and senior Keaton Jones, who was 10th in 1:01.98 with runs of 30.80 and 31.18. In the GS, other skiers figuring in Marquette’s scoring were Audette, fifth in 47.62 with runs of 24.50 and 23.12; junior Jack Franchino, 13th in 48.65 with runs of 24.49 and 24.16; and junior Truman Durand, 21st in 49.73 with runs of 24.51 and 25.22. Other finishers for the Redmen in the slalom were junior Drake Scheidt, 15th in 1:04.11, and Durand, 28th in 1:12.57. In GS, also finishing for Marquette was Grzelak, 34th in 52.24. Jones completed one run in this event and didn’t post a final score. In all from the 10 schools at the meet, there were 53 skiers who completed both slalom runs and 49 who did both GS runs. 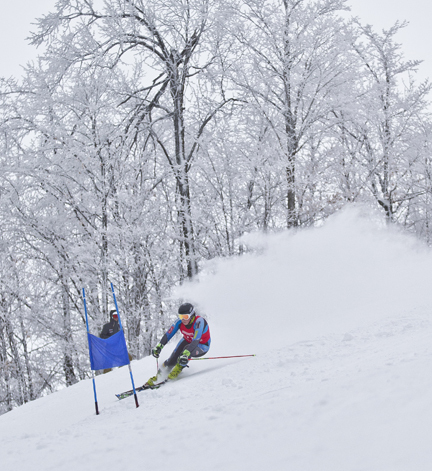 Junior Ainsley Kirk was the top finisher for the Redettes in both slalom and GS, which included a victory in the slalom by about 1.3 second over junior teammate and runner-up Jacey Johnson. Kirk clocked the top time in each slalom run of 27.74 and 28.21 seconds for a combined total of 55.95. Johnson had runs of 28.06 and 29.20 for a 57.26 total, just 0.12 of a second ahead of third-place Elizabeth Saunders of TC Central. Also scoring for MSHS in the slalom were senior Natalie Robinia, sixth in 59.07 with runs of 29.66 and 29.41; and sophomore Ada Bernard, 12th in 1:00.79 with runs of 29.94 and 30.85. In GS, Kirk had runs of 24.16 and 25.43 seconds for a 49.59 total, good for sixth. She was less than 0.6 of a second out of second place. Coming in right behind her was Robinia in seventh with runs of 24.08 and 25.62 for a 49.70 total. Also scoring for Marquette in this event were sophomore Ella Jones, 10th in 50.20 with runs of 24.56 and 25.64, and freshman Madalyn Stern, 23rd in 53.62 with runs of 26.13 and 27.49. Several other skiers also finished for the Redettes. In slalom, Jones was 15th in 1:01.97 while sophomore Zoey Brian was 20th in 1:03.68. In GS, Bernard was 31st in 54.95 and Johnson 51st in 1:08.51, though the latter had the second-fastest opening run of 23.48 seconds. For the girls, there were 52 finishers in slalom and 57 in GS.